For those who are relocating to Bremen for the first time or returning home from a stay overseas in the US, our groupage shipping service will route your household goods from anywhere in the US to enter the country through the main port of Bremerhaven. 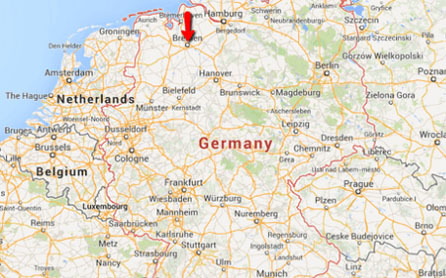 Fortunately, Bremen is also located in the north of Germany and is only about 45 minutes south of the port, depending on the route you want to take. Based on the volume of your household goods shipped overseas, you can choose to either collect your goods from the agents warehouse in Bremen or use the delivery services offered by our overseas agents. If your personal vehicle will not fit all your effects then you can also look into renting a moving van. This of course depends on how comfortable you are driving on German roads and if you are legally eligible upon arrival. If you are planning on purchasing a car after getting settled in or are waiting for your vehicle to arrive on a later date, renting a car can come in useful as a way of temporary transportation. There are no shortages of rental car providers in Bremen and you'll find services at the main train station as well as the city center. Settling into your new apartment or home will be at the top of the to do list, but in order to do that you're going to need to visit the right administrative authorities. Within two weeks of moving to Bremen and into your new residence with your belongings you are going to need to register with the local registry. Fortunately, if you've moved with your family, you will be able to register everyone not just yourself and it can be done either in person or via post. For this you will need your international passport, name and address of your landlord and the filled out registration form. After you move you'll want to look into getting insurance for your home, vehicle, and also health insurance. This German city is home to a few very reputable Universities and has numerous schools for k-12 education if you're moving with young ones. These include the University of Bremen, University of the Arts Bremen, Technical University for Public Administration and Jacobs University. Other educational establishments include the International School of Bremen, Hermann-Boese-Gymnasium (high school equivalent), Wilhelm-Wagenfeld-Schule and Hochschule Bremen. This area is literally the oldest district in Bremen and you'll be able to experience a little bit of the cities history. This is a lesser known attraction most likely because it's a restaurant below the city's town hall! This was just a taste of what Bremen has to offer, so let us help you make the move.